The purchase of this stamp/s will earn you 50 points valued at $1.00. This is an official United States Post Office Department badge used between the 1940's and 1960's. The Post Office Department seal on the badge, which was adopted in the 1830s, depicts a post route rider on horseback, although many people mistakenly believe it is based upon the short-lived Pony Express operated between St. Joseph, Missouri, and Sacramento, California. The badges are original and are in very good condition. Because they were actually used in daily service they have minor nicks, scuffs, and other signs of wear. The pin mechanism on the reverse operates as designed. The badge has been obsolete for at least 50 years. They were retired from service when photo identification badges were issued. This badge was purchased from a museum that was decreasing the size of their collection. This is one of a kind in stock. This is a photo of the actual badge you will receive. 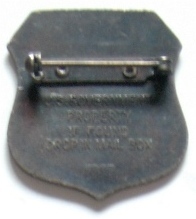 The reverse of this badge is pictured below.